For the most part the art work on the cards provide some very good representations of the characters from the TV series, although I’m sure that fan of the show may be surprised at some of the choices, Tyrion as the fool, smacks of someone who hasn’t watched a single episode. In many cases the card designations are linked to the show, so the Moon is represented by the Moon Gate, the King of Coins has a representation of Lord Petyr Baelish, who was the master of coin. There is variability in certain characters representations. For instance, Queen Daenerys Targaryen, appears on The Empress and has a very good likeness of Emilia Clarke, the Queen of Spears is an OK representation, whereas The Nine of Coins could be anyone if you remove the dress and dragons. That said, overall, the artwork is pretty good. The first twenty-two cards represent the major Arcana and hold mostly major characters or themes from the show. The cards are marked 0-XXI. 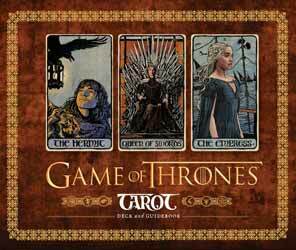 The back of all the cards are represented by a picture depicting the multiple swords on the iron throne. The minor arcana has four suits, Coins, Swords, cups and spears and a total of fifty-six cards. The set also comes with an accompanying one hundred and six-page booklet which not only explains the meaning of all the cards but also provides information in how to lay the cards out and what their positioning means. Overall, it’s an elegantly-designed pack, although I did have an issue with one of the trays. When the cards are stacked and stored in their tray they are three times as deep as the booklet. Not a problem for the cards but for the two trays to remain flush the right-hand side is glued to reduce the depth. Unfortunately, the glue gave way after only putting the book in the case a couple of times. The now collapsed tray made it even harder to put the book in and out of the box. In the end part of the cardboard surround ended up torn. 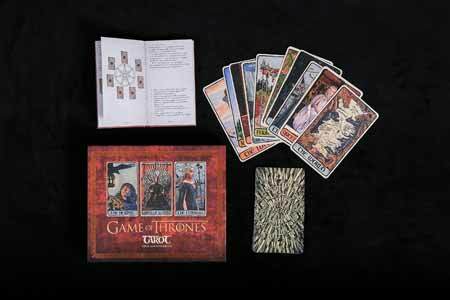 So not a bad bit of kit and will certainly appeal to anyone who have the dual interest in both Tarot and Game of Thrones.